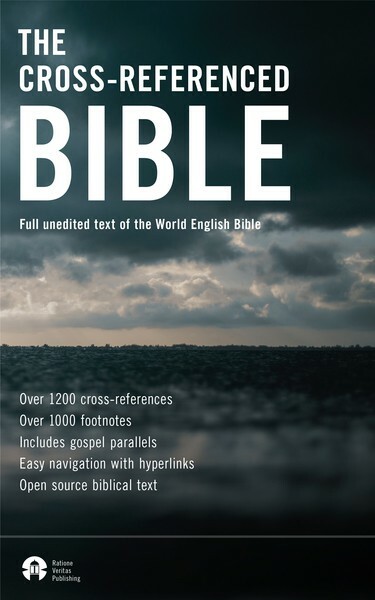 The Cross-Referenced Bible is going to be available on the 1 November (Get it here). This is a Kindle Bible, formatted to allow the reader to jump back and forth easily between relevant cross-references and explore the Bible with ease. The Hebrew word rendered “God” is “אֱלֹהִ֑ים” (Elohim).} created the heavens and the earth. You can see that it mushes together the footnotes, the verses, and the formatting. Since I wanted to add additional footnotes, I first extracted all this into the various components in a format that could be read by Python (the coding language I used to manage all this). <p><a href=”../Text/nav1.xhtml#Ge”><span class=”ch” id=”1v1″>1</span></a> In the beginning, God <a href=”../Text/footnotes.xhtml#0″>[*]</a> created the heavens and the earth. Between this, I created a script for tweaking the formatting of various lists such as the genealogies. Between all this administrative work was the interesting part of gathering cross-references and a few additional footnotes. This is likely an on-going piece of work. But the code then takes the spreadsheet with all this information and includes it in the epub format. If you would like to suggest additional footnotes or cross-references for future additions, please contact me. There is some editorial judgment involved since I want the manuscript to be readable in the end. But in general, I err on the side of inclusion. If you are looking for a Kindle version of the Bible, that is easy to navigate and explore, look no further. You can also make notes and highlight the text sync’ed across your devices (Kindle, tablet, phone) or online (read.amazon.com).